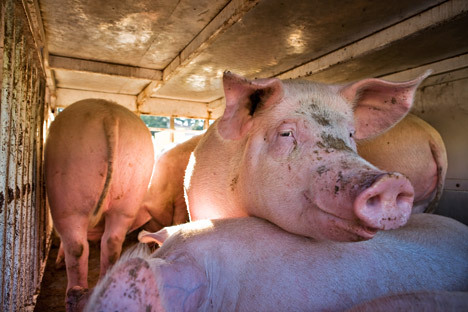 Although the ASFV poses no threat to humans, it inflicts multimillion losses to farmers because all pigs must be culled at a farm where the disease was registered. A former chief veterinary official of western Russia’s Bryansk region, Vladimir Ponomaryov, was sentenced to 5.5 years in prison for taking a bribe to conceal cases of the dangerous African Swine Fever Virus (ASFV). "The Bryansk regional court sentenced the former head of the Bryansk Region veterinary department, Valentin Ponomaryov, to 5.5 years in a high-security prison," the local prosecutors’ office said in a statement. Ponomaryov was found guilty of large-scale bribery and power abuse, the statement reads. He was also ordered to pay a 2 million ruble fine ($33,000). In March 2013, Ponomaryov concealed the discovery of the ASFV on two occasions. At first, he helped to hide the fact that the virus was found in 50 pigs, who escaped when the truck that transported them got into an incident in the region. In another case, the official ordered to hide the presence of the virus in meat at a local meat-processing plant. He received a bribe of 200,000 rubles for his efforts.